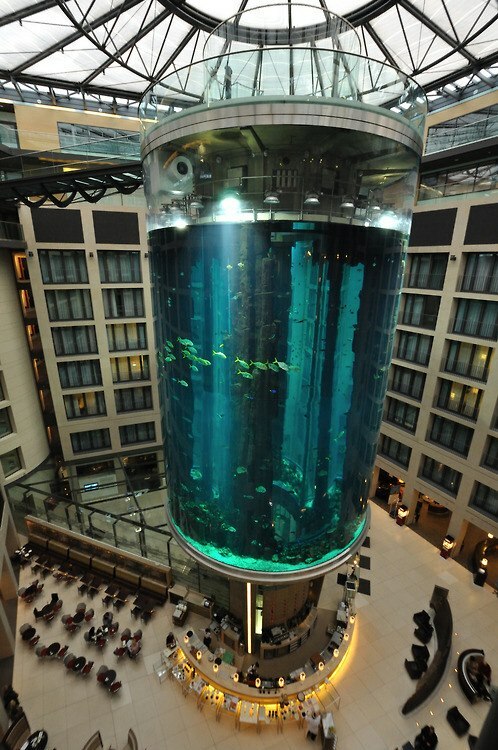 The AquaDom in Berlin, Germany, is a 25 metre tall cylindrical acrylic glass aquarium with built-in transparent elevator. It is located at the Radisson Blu Hotel in Berlin-Mitte. The DomAquarée complex also contains a hotel, offices, a restaurant, and the aquarium Sea Life Centre. The AquaDom was opened in 2004. It cost about 12.8 million euros. The overall construction of the aquarium was designed and built by International Concept Management, Inc.. The acrylic cylinder was constructed by the U.S. company Reynolds Polymer Technology. It is now the main attraction of the Berlin Sea Life Centre.